An electron microprobe operates under the principle that if a solid material is bombarded by an accelerated and focused electron beam, the incident electron beam has sufficient energy to liberate both matter and energy from the sample. These electron-sample interactions mainly liberate heat, but they also yield both derivative electrons and x-rays. Of most common interest in the analysis of geological materials are secondary and back-scattered electrons, which are useful for imaging a surface or obtaining an average composition of the material. X-ray generation is produced by inelastic collisions of the incident electrons with electrons in the inner shells of atoms in the sample; when an inner-shell electron is ejected from its orbit, leaving a vacancy, a higher-shell electron falls into this vacancy and must shed some energy (as an X-ray) to do so. These quantized x-rays are characteristic of the element. EPMA analysis is considered to be "non-destructive"; that is, x-rays generated by electron interactions do not lead to volume loss of the sample, so it is possible to re-analyze the same materials more than one time. Electron probe micro-analyzer (EPMA) Instrumentation - How Does It Work? An electron source, commonly a W-filament cathode referred to as a "gun." Strengths and Limitations of Electron probe micro-analyzer (EPMA)? An electron probe is essentially the same instrument as an SEM, but differs in that it is equipped with a range of crystal spectrometers that enable quantitative chemical analysis (WDS) at high sensitivity. An electron probe is the primary tool for chemical analysis of solid materials at small spatial scales (as small as 1-2 micron diameter); hence, the user can analyze even minute single phases (e.g., minerals) in a material (e.g., rock) with "spot" analyses. Spot chemical analyses can be obtained in situ, which allows the user to detect even small compositional variations within textural context or within chemically zoned materials. Electron probes commonly have an array of imaging detectors (SEI, BSE, and CL) that allow the investigator to generate images of the surface and internal compositional structures that help with analyses. Although electron probes have the ability to analyze for almost all elements, they are unable to detect the lightest elements (H, He and Li); as a result, for example, the "water" in hydrous minerals cannot be analyzed. Some elements generate x-rays with overlapping peak positions (by both energy and wavelength) that must be separated. Microprobe analyses are reported as oxides of elements, not as cations; therefore, cation proportions and mineral formulae must be recalculated following stoichiometric rules. Nearly any solid material can be analyzed. In most cases, samples are prepared as standard-size 27 x 46 mm rectangular sections, or in 1-inch round disks. Rectangular sections of rock or similar materials are most often prepared as 30-micron-thick sections without cover slips. Alternatively, 1-inch cores can be polished. 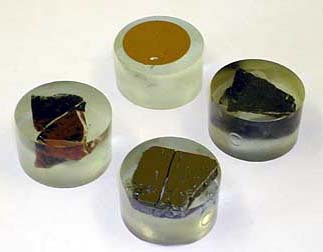 Chips or grains can be mounted in epoxy disks, then polished half way through to expose a cross-section of the material. The most critical step prior to analysis is giving the sample a fine polish so that surface imperfections do not interfere with electron-sample interactions. This is particularly important for samples containing minerals with different hardnesses; polishing should yield a flat surface of uniform smoothness. Most silicate minerals are electrical insulators. 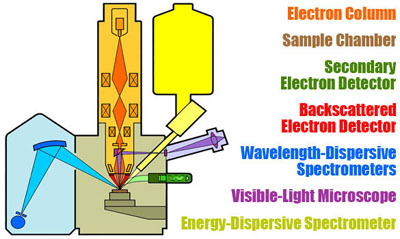 Directing an electron beam at the sample can lead to electrical charging of the sample, which must be dissipated. Prior to analysis, samples are typically coated with a thin film of a conducting material (carbon, gold and aluminum are most common) by means of evaporative deposition. Once samples are placed in a holder, the coated sample surface must be put in electrical contact with the holder (typically done with a conductive paint or tape). Choice of coating depends on the type of analysis to be done; for example, most EPMA chemical analysis is done on samples coated by C, which is thin and light enough that interference with the electron beam and emitted X-rays is minimal. Samples are loaded into the sample chamber via a vacuum interlock and mounted on the sample stage. The sample chamber is then pumped to obtain a high vacuum. To begin a microprobe session, suitable analytical conditions must be selected, such as accelerating voltage and electron beam current, and the electron beam must be properly focused. If quantitative analyses are planned, the instrument first must be standardized for the elements desired. Data collection and results of EPMA chemical analysis vary depending on method. Semi-quantitative EDS analysis is generally limited to recognizing different elements that may be present in an unknown sample. If one just wants to know what elements are present, there is little instrument set-up required. To determine the composition of an unknown phase quantitatively, WDS analysis is much more involved, requiring instrument standardization based on standards of known composition, followed by evaluation of quantitative results and assessment of errors. Before starting a microprobe session, it is best to have an analytical plan in mind based on prior petrographic observation so that one has a good idea of what phases to analyze in the samples of interest. If one wants to analyze plagioclase, for example, the microprobe analysis routine is set up accordingly for the elements of interest. For most microprobes with 4 or 5 crystal spectrometers, it is possible to acquire 10-12 elements in a given analysis. Because microprobe access is typically charged by the hour, it is best to be well organized ahead of time with a list of samples to analyze (by priority) and photomicrographs or photo maps of the areas of interest so that time is not wasted finding the right spots to analyze; good documentation will make the microprobe session go much more smoothly. Modern microprobes make it possible to collect large datasets of "spot" analyses of minerals with a high degree of accuracy and efficiency. Examples of typical applications include determination of compositional variations in zoned minerals (that can be related to elemental mapping), or multiple analyses of mineral parageneses for the purposes of geothermobarometry. Data output (after standardization, and numerous data correction procedures such as background substraction and a variety of 'matrix' corrections) is typically a data table of weight percent of the simple oxides that comprise each mineral. An example of qualitative data tables can be seen in the Results section of the WDS module. These compositional data can then be recalculated as mineral structural formulae based on stoichiometric principles. Reed, S. J. B., 1993, Electron Microprobe Analysis (2nd Ed. ), Cambridge University Press. Reed, S. J. B., 1995, Electron Microprobe Microanalysis, in Philip J Potts, John F. w. Bowles, Stephen J. B. Reed, and Mark R. Cave (eds), Microprobe Techniques in the Earth Sciences, The Mineralogical Society Series, vol 6., p. 49-90. Reed, S. J. B., 2005, Electron Microprobe Analysis and Scanning Electron Microscopy in Geology (2nd Ed. ), Cambridge University Press.